Last week I was lucky enough to have dinner with Donalyn Miller. That meant I was out later on a weeknight than I usually am (obviously for very good reason) and when I got on the highway to head home, I saw brake lights ahead and flashing lights...and the Expect Delays and Two Left Lanes Closed Ahead signs. Even in the middle of winter, it's apparently still construction season in Wisconsin. The flashing lights were because the construction workers were actively pulling the barrels into the roadway to block the two left lanes for overnight work. So what was once a three lane highway was now down to one. As I sat and waited as cars from three different lanes merged and slowly funneled into just one, it got me thinking. Now, normally this would be just another thing happening, but since I was heading home from a dinner with much conversation about teaching and books and things of that sort, my mind was spinning. This funneling of so many cars into one narrow lane where we all had to slow down got me thinking about the state of education. Is it really best to try to take so many people in varied states of readiness, ability, desire, and make them all conform to one narrow vision of what should be at that exact time? Ok...so maybe I'm losing my comparison here a little - of course we need to all move over and slow down for the construction workers and lanes being closed. But in the matter of education, is it really best to try to funnel all kids through the same narrow focus at a prescribed time? As I picture the slow down from all of those cars going to the one same place, all I could think of is that if we are doing that to our students, wouldn't that cause the same kind of jam? 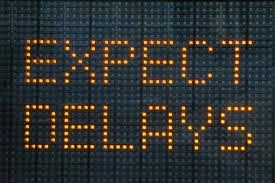 Expect delays ahead. Yeah. Some move slower, some are ready to go beyond, some have more capable vehicles, some need to watch more what's going on around them, some need to take a detour. Delays can be expected if we aren't thinking of our students as individuals with individual needs and paths to get there. If we try to funnel them all into the same lane, we're not meeting their needs, and we're likely just slowing things down for all. That vision of the funneling car has stuck with me and reminded me throughout the last week that I need to allow my kids to do what they need to do in their own way, and that they each may have their own path...there's not necessarily just one narrow funnel through which they must pass. Funny how one small thing + different thoughts in mind = a clarified perspective. I love when our brain makes connections -- when we allow our brain to calm down and make larger connections -- and so your turn from the road to the classroom was masterly done. Plus, you hung out with Donalyn. That's always a huge plus.